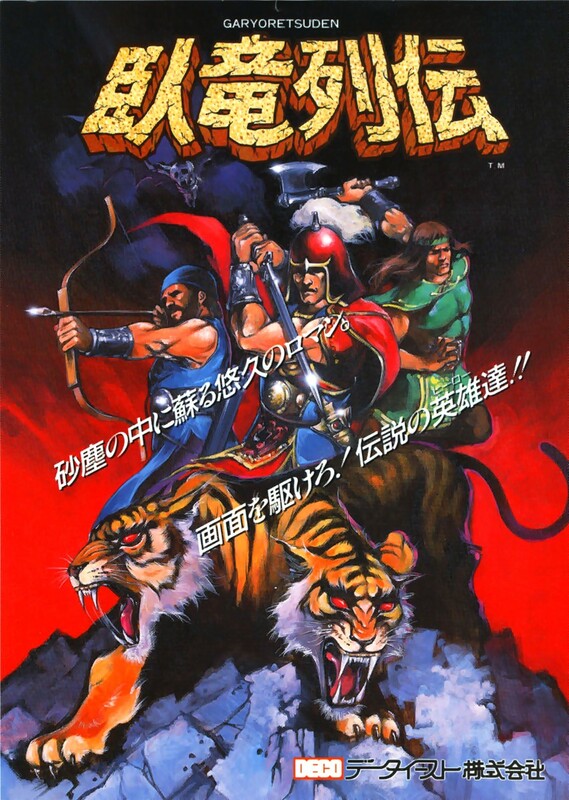 Garyo Retsuden is a weird, overhead run-and-gun with a “Romance of the Three Kingdoms” motif. 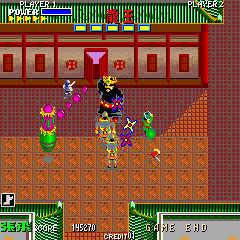 The heroes are three brothers: Liu Bei, Guan Yu, and Zhang Fei, as they set off to save the princess, held by Lu Bu. Each of them wields a different weapon – bow and arrow, axes, and throwing knives – but they all fundamentally play the same. Each level is filled with power-ups, including weapon upgrades, suits to absorb hits, and shoes to walk faster. There are also horses stationed regularly, which don’t really do a whole lot, but can absorb a bit of extra damage, and can be healed by gobbling up the carrots that are just lying around. 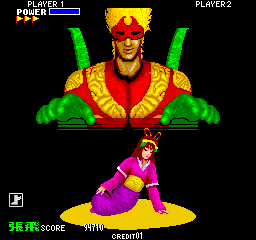 As far as run-and-guns go, Garyo Retsuden is fairly unrefined. The screen scrolls only when you’re about halfway up, making it difficult to see what’s in front of you. 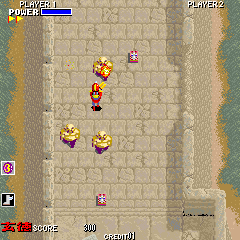 At any given moment there are generally half a dozen weak enemy soldiers lobbing projectiles at you, which aren’t too hard to deal with, but later areas pit you up against stronger enemies, who take large amounts of damage. The enemy distribution is done carelessly, as well, without any sense of balance, making the game overwhelming after just a few levels. 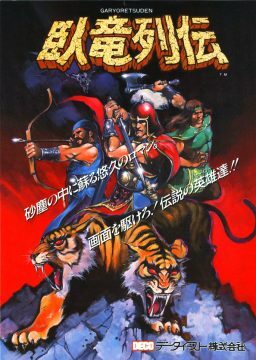 What makes Garyo Retsuden so memorable, though, isn’t the gameplay, but rather the numerous bizarre design decisions. For example, you have a life bar, and can take three hits before dying. Instead of draining like a normal game, it just changes color from blue to yellow to red. So why even design a life bar? Also, why does the icon for the armor look like a spacesuit? More pressingly, why are the enemy designs so bizarre? The first enemies you face are tiny little Karnovs. 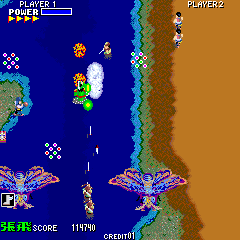 Later opponents include two-headed tigers, giant frogs, hermits who fly on clouds, monstrous slugs, and moths. 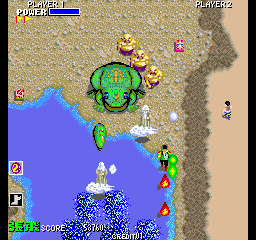 Then there are weirdly colored flying enemies that could best be described as flying pickles, or in some cases UFOs. Some of these are practically impossible to destroy, making it easier to just run past them. 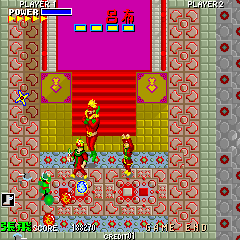 The bosses are also all taken from Romance of the Three Kingdoms, but the strangest one is, of course, Lu Bu. He wears a mask like Char Aznable and has spiky yellow hair like a Super Saiyan, and he flies around as he attacks with a few clones. This whole encounter must have been cut from the original novel. 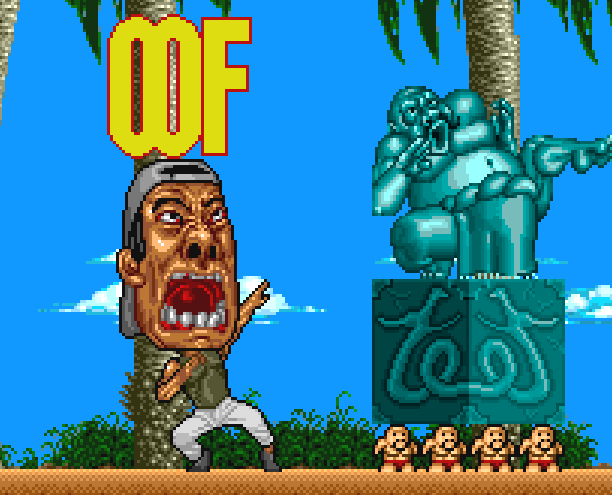 What on earth was going on with the development of this game? It’s not peak Data East like Trio the Punch, which is impossibly strange from the outset. Garyo Retsuden looks like a normal game at first and just gets more feverishly baffling as it goes on. Overall, it’s a pretty standard game from the developer of the era – bizarre and technically playable, but not all that great.